The Whirlpool Max 35 Silver is a smart looking microwave, providing a 13 litre capacity and 750w of power, complete with it's unique, yet unusual, space saving rounded back panel. Despite it's small capacity, it's very practical - doesn't need much kitchen space, and includes a handy steam mode for health eating. An unusual and slightly quirky design, which might not appeal to everyone. 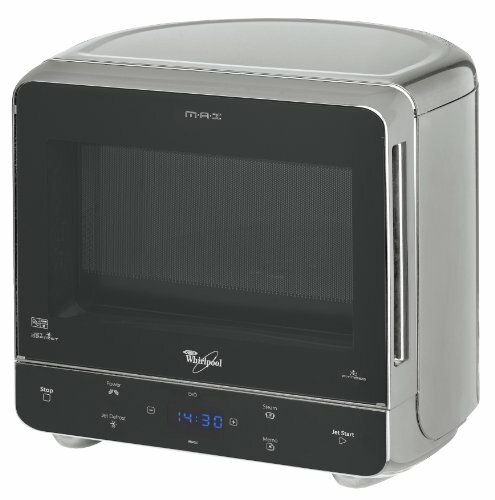 After a compact silver microwave that performs well, yet doesn't take up too much room? The silver Max 35 from Whirlpool may be the microwave for you - featuring a 13 litre capacity, a 28cm turntable and 750w of power. The clever rounded back design enables you to squeeze it into corners, taking up far less kitchen surface than a typical rectangular design solo microwave. Also included is a unique steam function, adding a level of versatility by enabling you to steam food in your microwave. The controls, which are situated at the base of the silver microwave oven, are clearly labelled, and all of our test team found them easy to use, without having to resort to the manual. Overall performance was very good - essentially this microwave is a compact yet highly effective cooking machine, and will suit any kitchen where space is of a premium. To conclude, the silver Max 35 is functional, slightly quirky looking with it's curved back panel, reasonably priced, and easy to use.